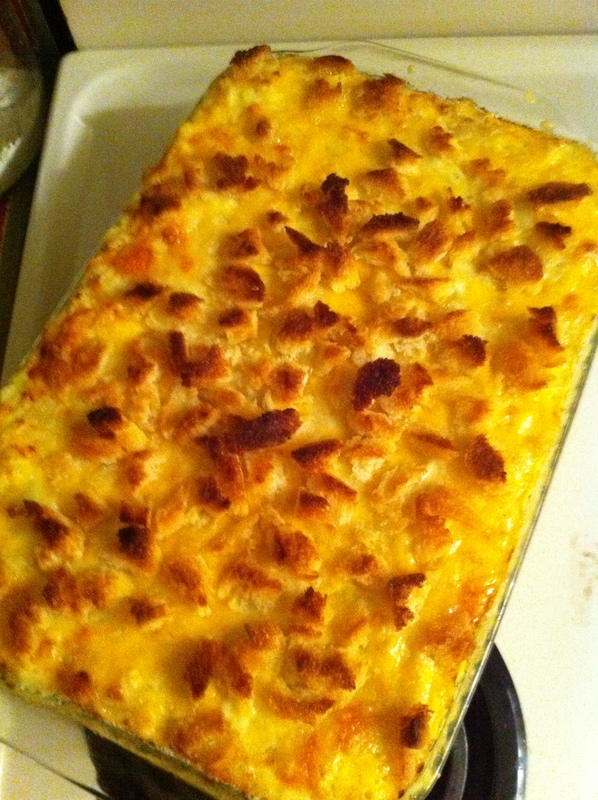 This recipe is essentially Martha Stewart’s “Perfect Macaroni and Cheese”. I have made a few alterations based on my own taste. The thing I really like about Martha’s recipe is that the proportions of ingredients seem to be just right. If you have ever made a mac-n-cheese that was like a dense brick of macaroni OR macaroni swimming in white sauce (less likely) then you know what I mean. I have made this probably 6 or 7 times and it comes out the same every time. Remove the crusts from the bread and tear roughly into ¼ to ½ inch pieces. Melt 2 tablespoons of butter and toss the bread with the melted butter to give it a little coating. Don’t add more—trust me this is plenty. Peel and crush the garlic roughly. Put into a pot—uncovered—with the milk on medium heat. You want the garlic to steep and for the milk to get hot—not boiling. If it looks like it is about to boil turn it down to low. Boil the macaroni for 2 minutes less time than the instructions recommend. Drain and rinse with cold water to stop the cooking. Set aside to drain. In a large deep pan, melt the remaining 6 tablespoons of butter over medium-high heat. When the butter is melted and foamy add the flour and whisk. Cook, while whisking, for 1 minute. Pour the hot milk into the pan through a strainer to remove the garlic pieces. Continue to whisk until the mixture is thick and smooth. This will take about 5 minutes. Remove from heat and add salt, pepper, nutmeg and cayenne. Whisk to incorporate completely. Add 3 cups of the grated cheddar and 1 ½ cups of the grated Gruyere cheese and stir until it is completely melted and incorporated. Put the drained and cooled macaroni into the cheese sauce and stir and fold until all the noodles are evenly covered. Dump the mixture into the baking dish and smooth it out (don’t press it down). Spread the rest of both cheeses evenly across the mixture. Spread the bread over the mixture. Place in the middle of the oven, uncovered, for 30 minutes.